In the beautiful Peak District at Stanage Edge. I was immediately hooked on ths TV series and I taped all episodes on a VCR… does anyone remember this prehistoric device?! No binge-watching whenever you felt like it in the good old nineties… Oh no… you had to browse through the TV guide very carefully not to miss any program you wanted to see and if you were lucky enough to have a VCR, you could program the films and TV series that you wanted to see later. And as a tape was maximum 4 hours… the things you programmed could not exceed that time…(what a disaster to go on a holiday!!! The programs I wanted to tape never fit on one VCR-cassette, so I remember asking my brother-in-law to come and change the tape halfway through our holiday !). Anyway… back to Pride and Prejudice and Mr Darcy… I would curl up in the sofa with drinks and snacks at the ready, making sure I didn’t have to go to the loo anymore as I was determined not to miss a single minute (oh yes… this was in the times before you could put your television on pause…). I absolutely love the storyline of Pride and Prejudice… All those sisters in one househould, quarelling, gossiping, teasing one another… Sweet Jane and adorable Bingly… but oh… fierce Elizabeth and pride Darcy!! Colin Firth is the perfect Mr Darcy in my opinion. The looks he gives, his attitude, his posture, the silences… and Jennifer Ehle is the perfect Elizabeth… with her sparkly eyes she adds life, joy and wit to her character. I have seen this BBC adaptation numerous times… first on my VCR (until the tape was completely ruined) and afterwards I bought it on DVD. 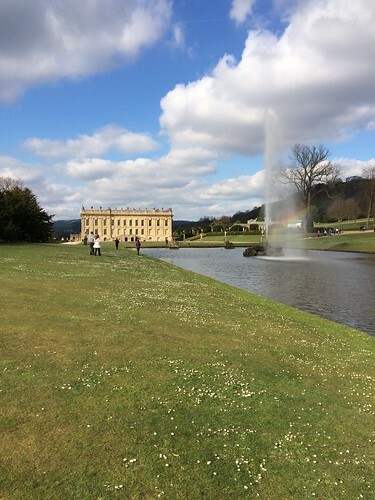 In April last year we went to visit the beautiful Peak District in England and we included some P&P themed walks and visits. 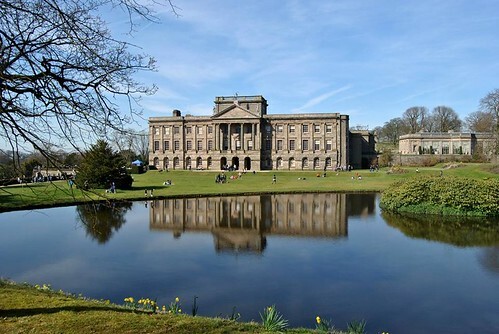 We visited Lyme Park. We went into this grand house, saw the courtyard, had a stroll in the park and saw the pond… you know, the pond where Mr Darcy comes out of after having a swim! At Lyme park I bought some Mr Darcy souvenirs of course… a mug, a bag and a linen bag for my friend in Australia. We also visited Chatsworth House which was used for filming the 2005 film with Keira Knightley (you may remember the sculpture gallery in the film!) and we also did a walk towards Stanage Edge like Keira Knightley did. In Chatsworth I bought a book ‘Mr Darcy’s diary’ by Amanda Grange, which tells the Pride and Prejudice story but this time from Mr Darcy’s side. Derbyshire, the county in which these beautiful estates can be visited, is so beautiful… we regularly go on a holiday to England and Derbyshire definitely is in my top three of most beautiful locations we have visited so far. Up until now I haven’t read the book by Jane Austen I’m ashamed to say… I have started it but never finished it, so that is definitely on my to do list for 2016! 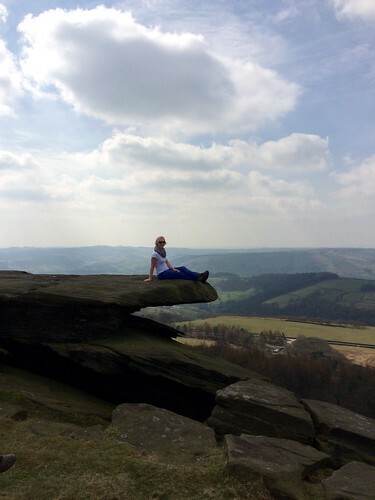 In this post you see another photo of me on Stanage Edge! This entry was posted in Personal, Quotes 'n thoughts and tagged jane austen, mr darcy, pride and prejudice, quotes. Fashion: Down coat & jacket… take your pick! Lovely pictures. I loved the movie Pride and Prejudice, it was lovely. Great post I enjoyed reading!